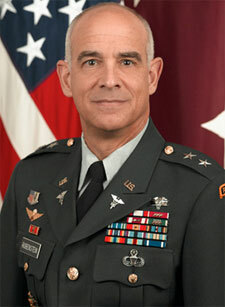 Major General David Rubenstein was the first in his family of seven to attend college. His experience as a student athletic trainer in high school sparked a career interest in healthcare, while his route to college was made possible by an Army ROTC scholarship. Commissioned as a Lieutenant in the Medical Service Corps in 1977, David began what has become a long and distinguished military career. In 1989, David graduated from the Army-Baylor Graduate Program in Health and Business Administration at Fort Sam Houston in San Antonio. There, he was mentored by a group of faculty who helped him become a skilled healthcare administrator and prepared him to mentor others. Those lessons served him well as he spent many subsequent years in command positions, including time as the Commanding Officer of Landstuhl Regional Medical Center in Germany, during which he led efforts to prepare and respond to wartime needs in Afghanistan and Iraq - and as Commanding General of the Army Medical Department and School where he had the opportunity to help envision, design, and train a new generation of military healthcare leaders. After retiring from the Army in 2012, David became a clinical associate professor of Health Administration at Texas State University. Among his dozens of military and civilian awards, he has been awarded the Distinguished Service Medal three times, received the American College of Healthcare Executives’ highest honor, the Gold Medal Award, and has been appointed an Honorary Healthcare Administration Graduate Professor at Baylor. Recognizing extraordinary servant leadership and excellence in the field of health care, we congratulate Major General David Rubenstein, recipient of the Medal of Service for Contributions to the Professions in Health Care.